Every waste treatment system in the world has a biosolids management issue. For some it is just volume disposal; for others it is toxic disposal; for still others the issue is meeting the discharge requirements. But what if all those problems just went away simply by cleverly stirring your sludge holding pond. After all, Nature has handled biosolids for millennia. It all starts with understanding how Nature does it and then mimicking her sustainable practices. Use oxygen to convert soluble substrate into insoluble biosolids and sink them. Convert acetic acid into methane and carbon dioxide. Nature does this by stratifying bodies of water. Aeration is at the top of the water column; methane generation is at the bottom. Nature chose to protect the specialized anaerobic bacteria in a biofilm bonded to a heavy calcium carbonate granule. The granule weight keeps the obligate anaerobes at the bottom of the water column far away from toxic oxygen. The next layer is an asymmetric quiescent layer in which produced solids settle. The fourth layer is the bio-granule layer with the gas-forming biofilm. Feeding granules is the key to digesting biosolids in situ. The produced gas fluidizes the alluvial sludge, bringing small granules and substrate into intimate contact. The produced carbon dioxide is converted into local carbonate anion. The carbonate reacts with calcium that entered in the black water and the granules grow bigger. The methane escapes. 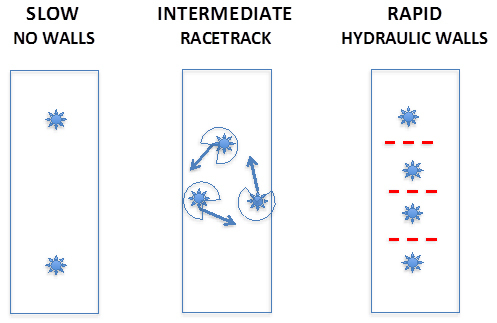 When the radial outflow from two adjacent 360° circulators impinge one on the other, equal and opposite flow vectors create a vertical hydraulic wall that transports surface substrate down to the hungry basement biofilm. Gas production increases. Raw biosolids have an unpleasant characteristic odor. Volatile fatty acids (VFA) are an inherent intermediate in the 4step digestion process. Sulfur odors, primarily H2S, must be eliminated. Nature has a successful countermeasure to sulfur odors. The electrical "cord" (actually a pila) electrically "plugs into" Methanosaeta. Electrons pass directly from Geobacter to Methanosaeta without making hydrogen gas. Discharge selected bacteria at the base of the water column. When the pH > 7.5 (once), the carbonate granules form in a high shear, aerated environment. Thereafter, acid consumption and local CO2 production makes carbonate anion in situ. Create hydraulic walls to bring sufficient substrate to the granules such that food transfer is not rate limiting. 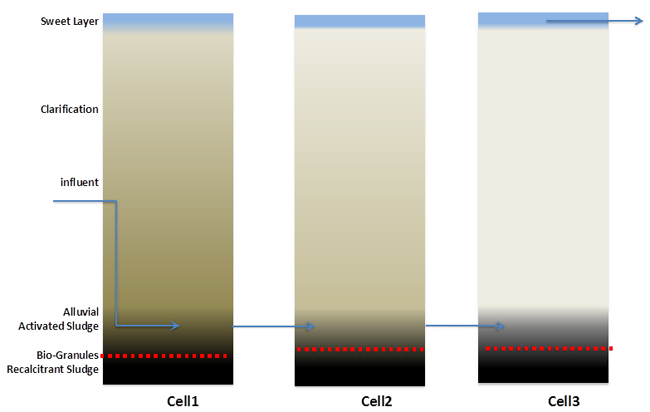 The inter-cell transfers occur low in the water column so that suspended solids enter in the fluidized bed of the downstream cell, not in the clarified supernatant. Your detention time is used for gas formation, not settling. The sweet layer is discharged from the final cell. The Blue Frog System (BFS) is an engineered system that induces granule formation and then selects for sludge digesting bacteria. Bacteria and immature granules are discharged at the base of the water column. Once formed, the granules colonize the entire lagoon bottom and naturally regenerate themselves as acid is biologically consumed and local carbonate anions are produced. 360° surface circulation without generating hydraulic walls slows the rate of sludge digestion. This strategy keeps the number of circulators to a minimum. 270° surface circulation is directional. When the flow feeds from one circulator to the next, the top 3ft of the water column is well mixed. 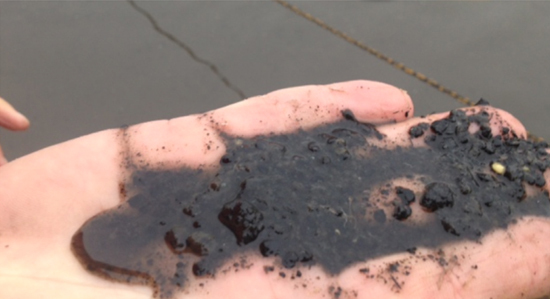 This makes the surface sweet layer thick to control odors in higher-concentration, sludge holding ponds. 360° circulators are placed in close proximity to the adjacent circulator. Hydraulic walls (red dashed lines) carry substrate to the granules and force feed them. This is used when ammonia reduction requirements demand rapid sludge digestion (a source of entombed ammonia, released as it is digested). About the author: Chip Bettle is Co-Inventor & Executive Vice President of Engineering for Absolute Aeration, LLC, Greeley, Colorado, USA. Chip is a chemical engineer who utilizes his unique perspective, straddling both science and engineering, to lead Absolute Aeration in process development. Chip designs complex, low cost solutions to meet regulated discharge requirements. As an inventor he has over 35 approved US patents. For further information, contact Brandi Waters, Absolute Aeration Customer Service Manager at (386) 233.5074 or email: brandi@bluefrogsystem.net.